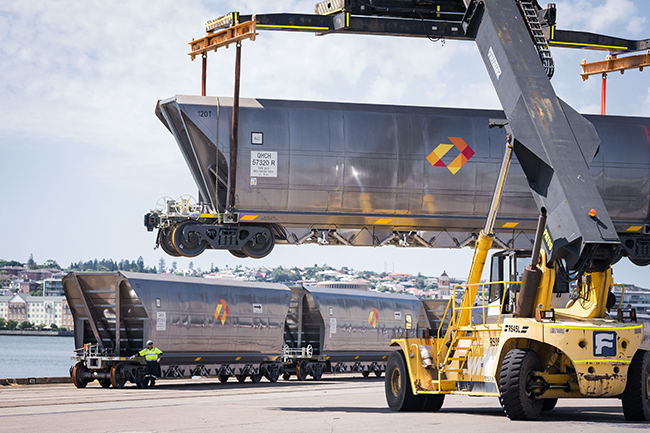 A shipment of 96 coal wagons arrived at the Port of Newcastle over the weekend to support Asia’s strong demand for the Hunter Valley’s high quality thermal coal. Ed McKeiver, Group Executive of Aurizon’s Coal business said the Company’s customers were helping power fast growing economies in Asia and on the Indian sub-continent with high-energy, low ash coal from Australia. "Although Japan continues to be the nation’s largest trading partner of thermal coal, importing 80 million tonnes of Australian thermal coal in the 2018 financial year (with around 80% sourced from the Hunter Valley), almost 10 million tonnes was exported from Newcastle coal terminals to newer trading partners such as India, Malaysia, Philippines and Thailand during the same period. “To support export volumes, our new wagons can carry up to 98 tonnes of coal, and with more than 80 wagons on every train, that means more than 8,000 tonnes of coal can be hauled to port on each load,” he said. “We continue to see strong growth in our Hunter Valley business with our coal haulage growing by 10% in the past financial year, from 47.7 million tonnes in FY2017 to 52.3 million tonnes in FY2018. Mr McKeiver said the wagons in the consignment are part of a bigger order that will see the Company's coal fleet expand to almost 9,000 wagons – more than a third larger than Aurizon’s closest competitor. “While the new wagons delivered on the weekend will enter service for our Hunter Valley customers, we have also ordered additional wagons to expand our rollingstock fleet in Queensland,” Mr McKeiver said.